Home > Mystery > Anunnaki: Why do some people believe the Sumerians were visited by aliens? 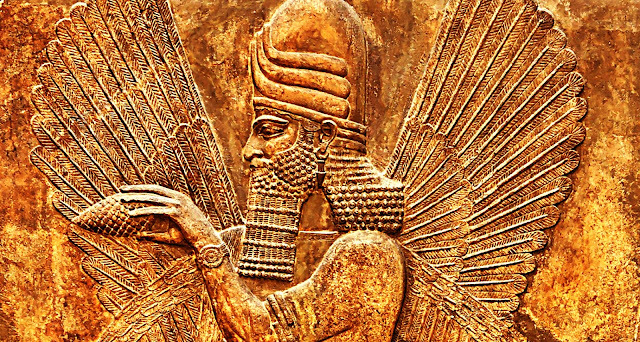 Anunnaki: Why do some people believe the Sumerians were visited by aliens? In recent years, the theory that humanity has been visited by aliens has more and more followers. Several ancient writings, which speak of beings who came from heaven, seem to support this hypothesis. Among these supposedly extraterrestrial beings are Anunnaki, the deity worshiped by the Sumerians. Did Anunnaki really come from another planet, then civilize mankind? Or is this just an erroneous interpretation of myths thousands of years old? Before the great pantheon of ancient Greece and before the ancient Egyptian gods, there were the gods worshiped by the Sumerians. This people lived in the Middle East on the territory of Iraq and Iran today. The Sumerians worshiped a number of deities, which they called Anunnaki. Anunnaki descended from An, the supreme being that reigned over all the Sumerian gods. According to the Sumerian legends, Anunnaki had arrived from heaven. The Babylonian myths of creation say there were 300 Anunnaki who kept the heavens and 300 others who guarded the underworld. These deities were so important that they were also mentioned in the Epic of Gilgamesh. Then things took a bizarre turn. As early as 2,500 BC, the people of Mesopotamia began to worship Enki. Enki was the son of the supreme god An. Now, to unfold the story until the nineteenth century, when archaeologists discovered tens of thousands of clay tablets in Babylon (the empire that was born in the territories occupied by the Sumer and Akkad kingdoms). The collections are so vast that they continue to be translated and researched even today. Called "The Twelfth Planet," Sitchin's book argues that the Sumerians believed that Anunnaki came from a mythical planet called Nibiru. According to Sitchin, Nibiru has an enormous orbit around the Sun, which he runs completely in 3,600 years. When, in the distant past, Nibiru was close to Earth, that is, about 450,000 years ago, Anunnaki would have decided to visit Terra. Were the Anunnaki gods aliens? Sitchin claims that Anunnaki landed in Sumer, determined to exploit Tereri's natural riches. As they could not exalt their own gold, they created a species of beings called "people" to work for them. Sitchin's book was sold in millions of copies. Sitchin and his predecessors, Swiss author Erich von Danniken and Russian author Immanuel Velikovsky, believed ancient texts were not just myths. All three believed that ancient Babylonian texts were, in fact, scientific journals, and that Anunnaki had extraterrestrial origins. Thus, according to the authors, people had been created to serve their extraterrestrial masters, who needed the riches of the Earth to sustain their civilization. Without exception, academics and conservative historians categorically rejected Sitchin and his colleagues. Babylonian stories, they say, are just myths created by ancient people in an attempt to explain the world. Since then, science has advanced and explained natural phenomena, astronomy, animals, and other things that were once thought to be the work of the gods. One thing we can not doubt: the ancient Babylonians were more advanced than modern people think. A clay tablet translated in 2015 shows that astronomers had extremely precise mathematical calculations about Jupiter's orbit of 1,400 years before Europeans. Also, Babylonians may have created trigonometry, a thousand years before the ancient Greeks. Does that mean that ancient Sumerians had extraterrestrial visitors who taught advanced math? Did ancient civilizations have access to computers or complex computing technologies? Those who believe in the ancient aliens theory, popularized today by a very popular TV series, are convinced that yes. Others claim that the ancients had plenty of time to develop mathematics and make detailed observations of the sky without the need for technology. No one knows what the Sumerians were thinking about when they wrote about Anunnaki. On the one hand, conventional historians contradict theories about ancient aliens. On the other hand, the followers of this theory do not believe it was possible that these missing civilizations had such advanced knowledge without "help out". Perhaps the mysteries of Anunnaki have nothing in common with aliens, but only with a lack of information about ancient cultures. The little we know about Sumer comes from clay tablets, written in a language no one talks about today. To learn more, archaeologists need to decipher as many writings as possible at that time.